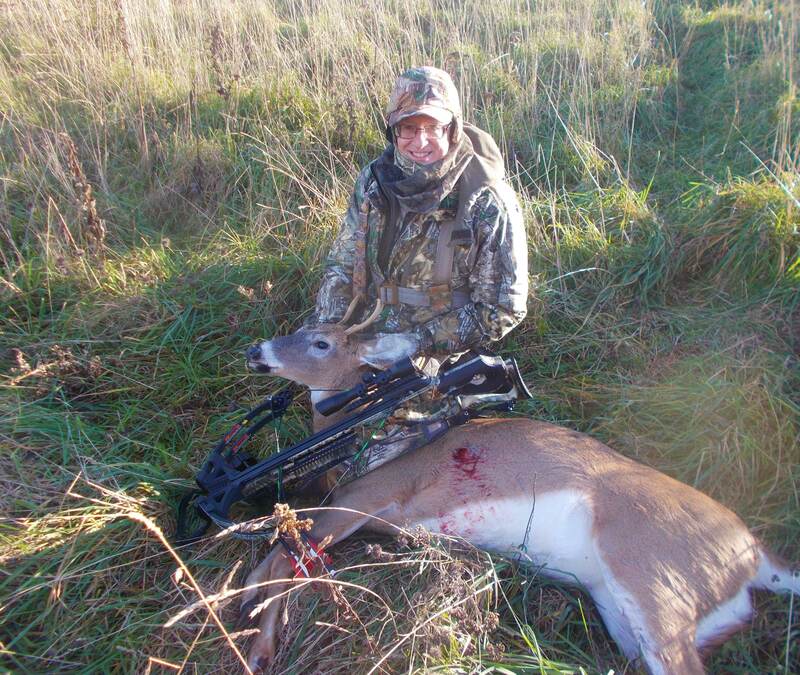 I shot a buck last week with the crossbow. The events of the day were most unusual and not one I think I have ever had before. The story may sound crazy to some of you but I have thought about sharing it because I want God to get the glory for what happened. I am going to paste the story as I typed into my Facebook page, Reflections in God's Great Outdoors. I will also post the pictures. It is hard to say exactly what happened today except it was one of those days that God shows up with no misunderstanding at all! I was able to hunt the entire day today and at lunchtime, went to McDonald's in Keyser's Ridge. Enjoying my coffee back at the property I hunt, I thanked God out loud for allowing me to enjoy His great outdoors! I broke into tears for no apparent reason other than I knew God's presence was there! So let 's go on the afternoon hunt. Around 2:45 a very large one antlered spike came under my stand and offered me many shots. I was hesitant thinking that I would wait for something larger. I have never been a big antler hunter. I enjoy the hunt itself and all the preparation. Whether I get a large antlered buck or not is not really important. I enjoy the meat so a harvested deer will provide exactly that! Would I enjoy getting a big one having all the bragging rights? Sure, who wouldn't? So as I am contemplating what to do, I whisper this, "That deer is nice but I really would like one with antlers on both sides." You know that God give us the desires of our hearts? Immediately, and I mean immediately after saying that, I hear the rustle of leaves below my stand and here comes a deer. And guess what is on his head? Yes, antlers on both sides just as I had wished for! Coincidence? I hardly think so! I felt that this was a gift from God and I really could't really tell God at that point that it wasn't big enough. I felt that if God did His part, then I better do mine! I waited for the right time and took the shot. I followed the blood trail and then lost it.I called a friend that had offered his assistance earlier in the day. While I waited for my friend to come, I literally went on my knees and asked God that we could find the deer! 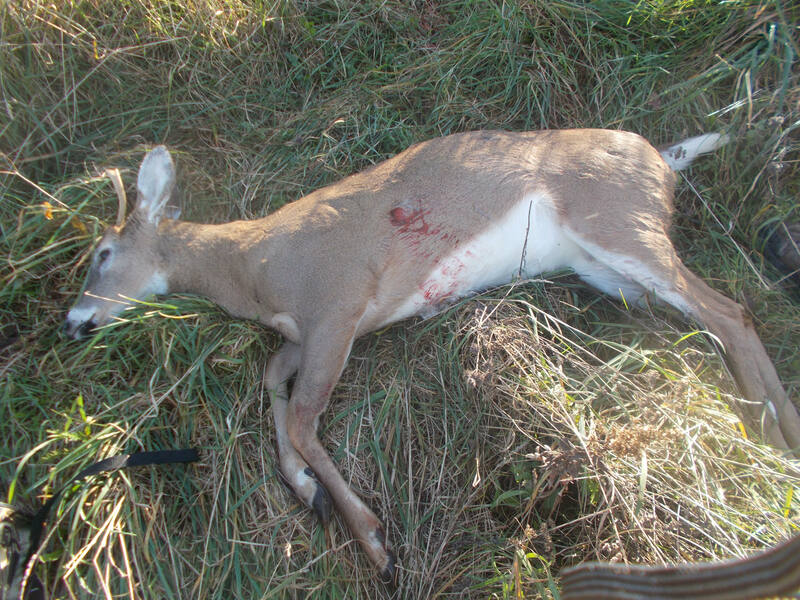 We searched together, picked up the blood trail and located him not 20 yards from where I had lost the trail. After that second deer came, I decided that I would give up my bragging rights for a big antlered deer, so I could brag about Him and what He did! What an awesome God we serve! 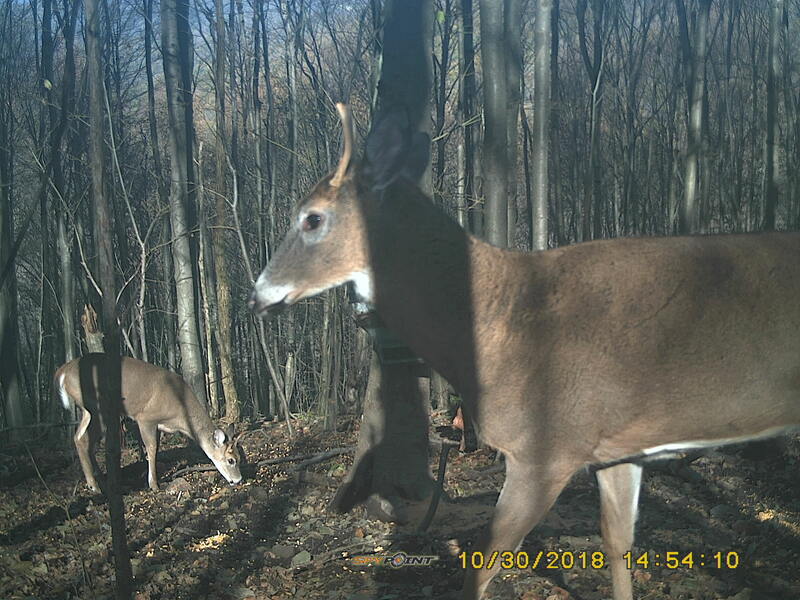 This was a picture from my trail camera of the two bucks mentioned in the story. The one closest to you is the buck I shot. The other was the single antlered buck that came in first. Re: A Day Like No Other! Bearclaw, that is a great story. I have asked for the Lord's help when trying to find a deer a time or two, just as you did. He comes through. Great story thanks for sharing it . I love it when His plan comes together, you had a pretty good plan too and I'm happy that they came together at the same time. Congrats on a nice buck, enjoy those chops. Well done BC, you got the right perspective on things, congratulations & enjoy those backstraps! Sounds like a truely memorable hunt. Congrats!! Your prayers were answered and you got meat in the freezer!